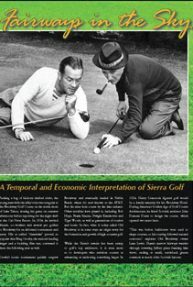 Packing a bag of hickory–shafted clubs, the young man with the silky voice was a regular at the Brockway Golf Course on the north shore of Lake Tahoe, honing his game on summer afternoons before reporting for the night shift at the Cal–Neva Resort. In 1934, he invited friends, co–workers and several pro golfers to Brockway for an informal tournament and party. His so–called “clambake” proved so popular that Bing Crosby, the nation’s leading singer and a budding film star, convened it there the following year as well. Crosby’s iconic tournament quickly outgrew Brockway and eventually landed in Pebble Beach, where it’s now known as the AT&T. But the nine–hole course by the lake endures. Other notables have played it, including Bob Hope, Frank Sinatra, Dwight Eisenhower and Tiger Woods, as well as generations of tourists and locals. In fact, what is today called Old Brockway is in some ways an origin story for the formation and growth of high–country golf.